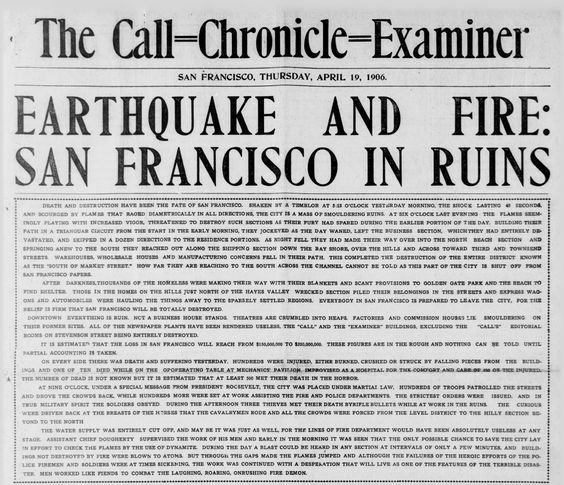 The earthquake in San Francisco at 5:13, the morning of April 18th, 1906, started more than 50 fires. The acting Chief of the Fire Department, John Dougherty, had 52 reported to him, but we are of the opinion that two of these were developed from another fire, leaving fifty of his accounted for. Testimony given in the trial of a suit on an insurance policy produced two not recorded by Mr. Dougherty, and it may be that there were others not reported, so that we cannot fix the number anymore accurately than to say more than fifty. The ultimate work of these fires was the destruction of a large part of the City, which is matter of general knowledge, and not relevant to the subject of this paper. But to tell how the different fires progressed, or were stopped, and the different directions they took, because of topographical, climatic and other circumstances is the particular purpose of this investigation. The sources of information are many, the important ones being personal narratives of persons whose interests, namely, homes, stores, or offices, led them to pay particular attention to the spread of the fire and makes their statements, as to time more reliable than that of the casual observer; reports of policeman who worked on the fire lines; reports of Army Officers in charge of Dynamiting; and most valuable of all, reports of the firemen who were actually engaged in fighting the flames and who consequently knew better than any one else the direction which each particular fire took. We have of course taken into consideration the fallibility of the human mind under conditions so unusual, and statements as to time, are never accepted as absolutely correct, and in this paper we shall only attempt to give the approximate hours. The time during which the City burned is divided into four periods, not of equal duration, but into which the event seems to divide itself for territorial and other reasons. The first period will cover the breaking out of many fires in many places immediately after the earthquake, the stopping of some of these fires by the Fire Department and others, and the progress of the survivors up to about 1 P. M. the first day. The second period will take the fires burning at that time and trace their progress until midnight of the first day. The third will cover in two sections the spread of the fire up to Van Ness Avenue, North of Market Street, and to Twentieth and Dolores Streets in the Mission, and the fourth will be a short and simple report of the fire which started at Van Ness Avenue on the 20th of April and burnt east joining the fire from the north which burned to North Beach. From California Street to bottom of image are Sacramento, Clay, Washington, Jackson and Pacific. 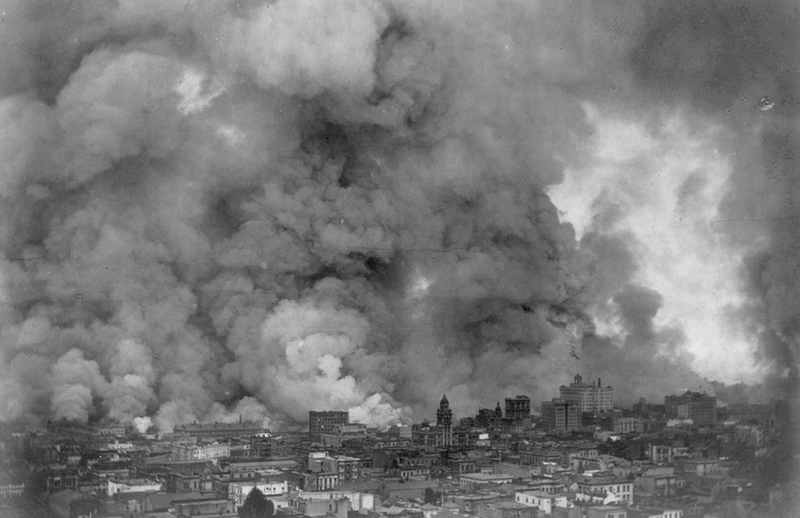 San Francisco was wrecked by a Great Earthquake at 5:13 a.m., and then destroyed by the seventh Great Fire that burned for four days. Hundreds, perhaps thousands of trapped persons died when South-of-Market tenements collapsed as the ground liquefied beneath them. Most of those buildings immediately caught fire, and trapped victims could not be rescued. Reevaluation of the 1906 data, during the 1980s, placed the total earthquake death toll at more than 3,000 from all causes. Damage was estimated at $500,000,000 in 1906 dollars. Fire Chief Engineer Dennis T. Sullivan was mortally wounded when the dome of the California Theatre and hotel crashed through the fire station in which he was living at 410-412 Bush St. Acting Chief Engineer John Dougherty commanded fire operations. The earthquake shock was felt from Coos Bay, Oregon, to Los Angeles, and as far east as central Nevada, an area of about 375,000 square miles, approximately half of which was in the Pacific Ocean. The region of destructive effect extended from the southern part of Fresno County to Eureka, about 400 miles, and for a distance of 25 to 30 miles on either side of the fault zone. The distribution of intensity within the region of destruction was uneven. Of course, all structures standing on or crossing the rift were destroyed or badly damaged. Many trees standing near the fault were either uprooted or broken off. Perhaps the most marked destruction of trees was near Loma Prieta in Santa Cruz County, where, according to Dr. John C. Branner of Stanford University, “The forest looked as though a swath had been cut through it two hundred feet in width.” In little less than a mile he counted 345 earthquake cracks running in all directions. Fireman James O’Neill, drawing water for the horses in Fire Station No. 4 on Howard Street opposite Hawthorne, was killed when a wall of the American Hotel collapsed onto the fire station. Police officer Max Fenner was mortally wounded when a wall collapsed upon him at 138 Mason Street. All telephone and telegraph communications stopped within the city, although some commercial telegraph circuits to New York and to India, via the Pacific cable at the Ocean Beach, remained in temporary operation. A messenger arrived at Ft. Mason at 6:30 a.m. with orders from Gen. Frederick Funston, United States Army to send all available troops to report to the mayor at the Hall of Justice. First army troops from Fort Mason reported to Mayor Eugene E. Schmitz at the Hall of Justice around 7 a.m.
At 8 a.m., the 10th, 29th, 38th, 66th, 67th, 70th and 105th Companies of Coast Artillery, Troops I and K of the 14th Cavalry and the First, Ninth and 24th Batteries of Field Artillery arrived Downtown to take up patrol. Seventy-five soldiers from Companies C and D, Engineer Corps were assigned to the Financial District at 8 a.m., and another 75 along Market from Third Street to the City Hall at Grove and Larkin streets. A major aftershock struck at 8:14 a.m., and caused the collapse of many damaged buildings. There was much panic. Second day session of the Grand Chapter of the Royal Arch Masons of the state of California fifty-second annual convocation. 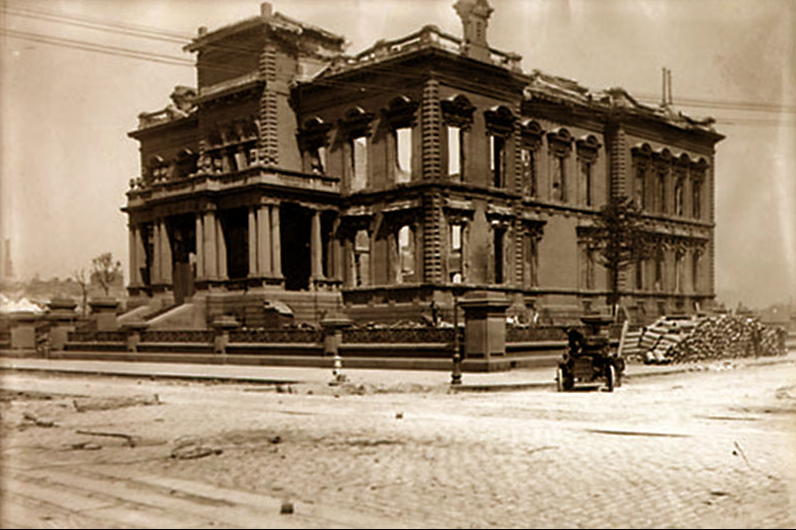 The group met after the earthquake but evacuated before the temple at Montgomery and Post streets was destroyed by fire. The Masons listed the date as April 18, A.I. 2436, A.D.
At 10 a.m. Headquarters and First Battalion 22nd Infantry, were brought from Ft. McDowell by boat, and were held for a time in reserve at O’Farrell St. They were later utilized as patrols and to assist the fire department. At about 10:05 a.m. the DeForest Wireless Telegraph Station at San Diego radioed press reports of the disaster at San Francisco to the “U.S.S. Chicago.” Admiral Caspar Goodrich immediately ordered fires started under all boilers, and after a confirmation message from the Mayor of San Diego, the “Chicago” steamed at full speed for San Francisco. It was the first time wireless telegraphy was used in a major natural disaster. At 10:30 a.m., the “U.S.S. 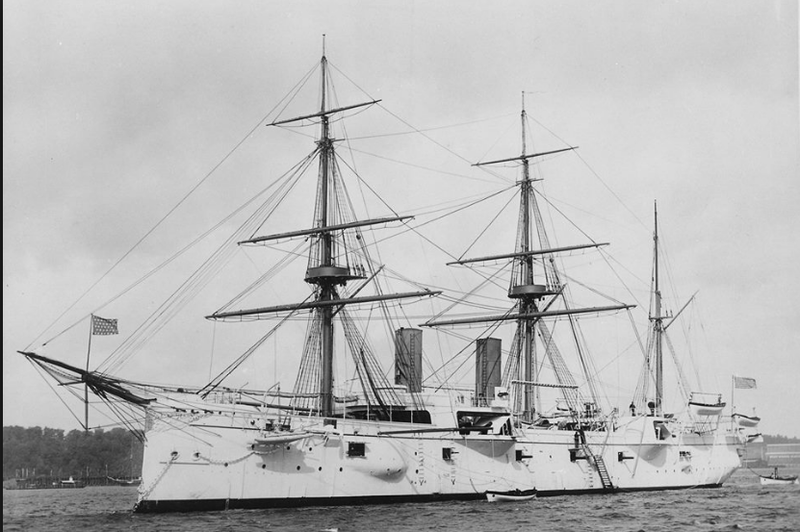 Preble” from Mare Island, under the command of Lt. Frederick Newton Freeman, landed a hospital shore party at the foot of Howard St. to help the wounded and dying who sought help at Harbor Emergency Hospital. Another fire broke out at 395 Hayes St. on the southwest corner of Hayes and Gough. It would become known as the “Ham and Egg” fire, and would destroy part of the Western Addition, the Mechanics’ Pavilion, City Hall and then jump Market Street at Ninth. General Funston’s staff abandoned the Dept. of California’s Headquarters in the Phelan Building, across from the Palace Hotel, at 11 a.m. They did manage to save valuable records. Winchester Hotel caught fire at Third and Stevenson streets and collapsed at 11 a.m.
Fort Miley troops, the 25th and 64th Companies Coast Artillery, arrived at 11:30 a.m.
Two earthquake in Los Angeles just before noon, about ten minutes apart. The quaking began as crowds gathered around bulletin boards to read the latest telegraphic dispatches from San Francisco. Thousands ran in panic when the earthquakes struck. Hearst Building at Third and Market streets caught fire at noon. Evacuation of the injured from Mechanics’ Pavilion, Grove and Larkin, began at noon because of the spreading “Ham and Egg” fire. The wounded were taken to Golden Gate Park, Children’s Hospital and the Presidio. Mechanics’ Pavilion took fire at 1 p.m.
St. Mary’s Hospital at First and Bryant sts. was abandoned to the fire at 1 p.m. Patients were loaded aboard the ferryboat “Modoc” and taken to Oakland. Entire area in the Financial District, behind the Hall of Justice, was on fire by 1 p.m. Fires so threatened the Portsmouth Square area by 1 p.m. that General Manager Hewitt of the Dept. of Electricity decided to abandon the Central Fire Alarm Station at 15 Brenham Place in Chinatown. Restaurant atop the Call, or Claus Spreckels Building, at Third and Market streets, took fire at 2 p.m. Postal Telegraph operators transmitted their last message to the outside world as army troops ordered them from the building at 534 Market St., opposite Second St., at 2:20 p.m. because of the approaching fire. Latest casualty count: 750 people seriously injured people were being treated at various hospitals at 2:30 p.m.
Dynamiting of buildings around the U.S. Mint at Fifth and Mission streets began at 2:30 p.m.
U.S. Army Signal Corps established Ferry Building telegraph operations at 3 p.m. The Mayor appointed ex-Mayor James Phelan to head the Relief Committee. Fifty or more corpses had been buried by the police in Portsmouth Square by 5 p.m because the morgue and police pistol range could hold no more bodies. Mayor Schmitz, at 8 p.m., was still confident that a good part of downtown could be saved. Unfortunately a possible arsonist set fire to the Delmonico Restaurant in the Alcazar Theatre Building on O’Farrell near Stockton, and that blaze burned into Downtown and to Nob Hill. War Department received a telegram from Gen. Funston at 8:40 p.m., Pacific Coast time, that asked for thousands of tents and all available rations. Funston placed the death toll at 1000. Firefighters attempted to make a stand at 9 p.m. along Powell St. between Sutter and Pine, but it was unsuccessful in keeping the fire from sweeping up Nob Hill. Crocker- Woolworth Bank Building at Post and Market took fire at 9 p.m. Governor Pardee arrived in Oakland at 2 a.m. He was supposed to arrive three hours earlier, but his train was stalled because of sinking of the track in the Susuin marshes. The governor said he would declare a bank holiday today. St. Francis Hotel at Union Square caught fire at 2:30 a.m.
Mayor Schmitz and Capt. Thomas Magner of Engine No. 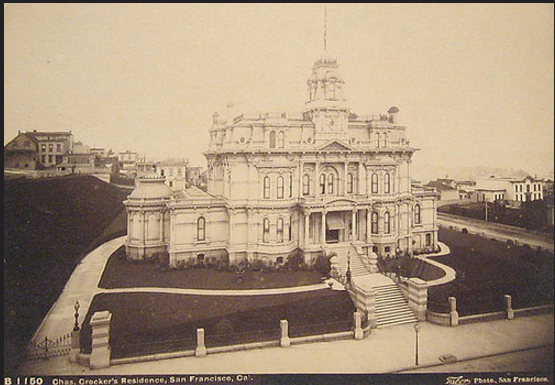 3 found a cistern at the Hopkins Mansion, Mason and California streets, at 4 a.m., and attempted to keep the fire from burning the structure. They were not successful. Secretary of War Taft at 4 a.m. ordered 200,000 rations sent to San Francisco from the Vancouver Barracks. Secretary Taft ordered all hospital, wall and conical tents sent to San Francisco from army posts at Vancouver; Forts Douglas, Logan, Snelling, Sheridan and Russell, from San Antonio and the Presidio of Monterey. Secretary Taft wired Gen. Funston at 4:55 a.m. that all tents in the U.S. Army were en route to San Francisco. 176 prisoners moved from city prison to Alcatraz. “U.S.S. Chicago” arrived in San Francisco Bay at 6 p.m. The Great Fire reached Van Ness Avenue during the evening. The army dynamited mansions along the street in an attempt to build a fire break. Demolition to stop the fire was ordered by Colonel Charles Morris of the Artillery Corps. The fire burned as far as Franklin St. by 5 a.m., then attempted to circle south. At the foot of Van Ness Avenue, 16 enlisted men and two officers from the “U.S.S. Chicago” supervised the rescue of 20,000 refugees fleeing the Great Fire. It was the largest evacuation by sea in history, and probably as large as the evacuation of Dunkirk during World War II. Fire approached the Appraisers’ Building for a second time at 3 p.m. Lt. Freeman attempted to pump saltwater from the Bay but found that his hose connections would not fit those of the Fire Department, so the effort was abandoned. Gen. Funston issued General Orders No. 37 which placed Lt. Col. George Torney of the Medical Department in full control of sanitation in San Francisco. Gen. Funston wired War Department at 8:30 p.m. on status of the fire. He advised that Fort Mason has been saved, and some looters have been shot. His telegram said most casualties are in the poorer districts, South of Market St.; not many killed in better portion of the city. Haig Patigian’s statue of President McKinley, commissioned for the city of Arcata, found in the rubble of a local foundry and saved by several artisans who carried it into the street. The fire that swept the Mission District was stopped at 20th and Dolores sts. by three- thousand volunteers and a few firemen who fought the blaze with knapsacks, brooms and a little water from an operating hydrant at 20th and Church. Fire Chief Engineer Dennis T. Sullivan died at the Army General Hospital at the Presidio at 1 a.m. The earthquake period is gone. Once the pent up forces of nature have had a vent, nothing of a serious nature need be apprehended. At the most a succession of minor shocks may be felt and that’s all. It is not unreasonable, therefore, for people to continue in dread of a new destructive temblor. People should fearlessly go to work and repair mischief done and sleep quietly at night anywhere at all, especially in wooden frame. Never mind foreboders of evil: they do not know what they are talking about. Seismonetry is in its infancy and those therefore who venture out with predictions of future earthquakes when the main shock has taken place ought to be arrested as disturbers of the peace. Major-General Adolphus W. Greely, Commander of the army’s Pacific Division returned to San Francisco. United Railroad crews began stringing temporary overhead trolley wires on Market St., but did not repair the cable traction system in the street. 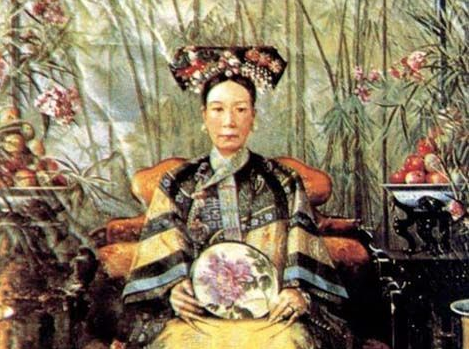 Imperial decree on the 30th Day of the Third Moon from Empress Dowager of China to send 100,000 taels as a personal contribution to the relief of the San Francisco sufferers. President Theodore Roosevelt declined the offer, as well as donations from other foreign governments. Noble, but how odd for a U.S politician. Bearing in mind the conditions at the end of the period just covered, it will not be hard to follow the fires during the following thirty hours. We shall take the north of Market Street fires, and carry them to Van Ness Avenue, and to the north, and then go back and try and follow the Mission fire to Twentieth and Dolores Streets. Working almost due west through Chinatown and the remaining portion of the retail district, the fire spread along Post, Sutter, Bush, and streets farther north, it gradually destroyed building after building, and around three or four o'clock of the nineteenth Powell Street became its resting line. 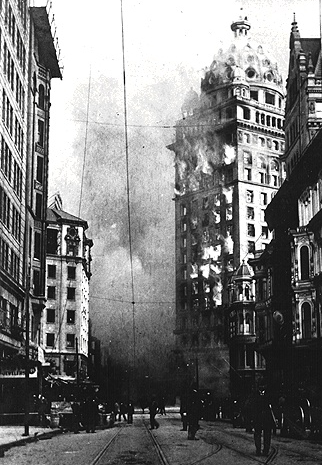 The Alcazar fire burnt up Powell Street and at two o'clock A.M. the St. Francis was on fire. Going north to Sutter, this fire joined the fire from Kearney Street. At three A.M. Old St. Mary's Church on California Street was burned, and a little later flying embers ignited the colored church on the east side Powell Street near Bush. Another street which the authorities had thought to make the western limits was crossed, and all thoughts of the fire stopping east of Van Ness were given up. The usual west wind failed to help the firemen in their fight. Powell Street was for some distance an admirable place for an ordinary fire to go out. Union Square, occupying the block bounded by Post, Geary, Stockton and Powell Streets ought to have helped in the fight, but fire burned all around it. The block above Post Street, was only partly filled with buildings, as excavations for a new structure were in progress. Above Pine, toward Nob Hill the block was occupied by the Stanford House, which set well back from the street, and should have been easy to save; and north of California, to Sacramento, was the magnificent new Fair mount Hotel, with a wide terrace on the east. But the vulnerable block, with its wooden church steeple, broke the chain of fortification, and everything must burn. Between Pine Street and Geary the line of fire worked west burning everything thoroughly. The district of alleged fire-proof buildings had been passed over, the St. Francis being the last, and to the west lay block after block of residences, family hotels and apartment houses. North of Pine Street the fire stopped at Powell Street for a short time and burned around the Fairmount along Sacramento, Clay and Washington Streets, and early Thursday morning crossed Washington Street to the North. 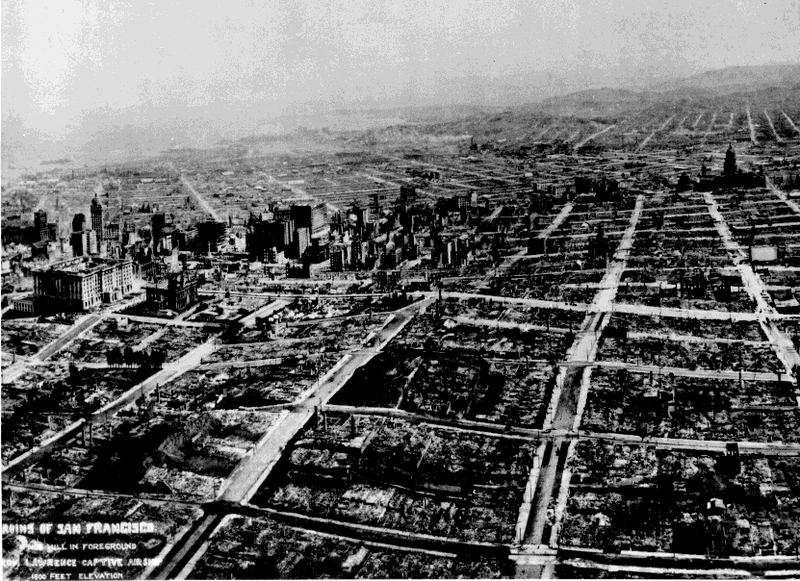 A new section along the ridge of Nob Hill, and down across to Russian Hill became the fire's prey. In the district south of Geary Street to Market, the fire burned vigorously, to the south and to the west. 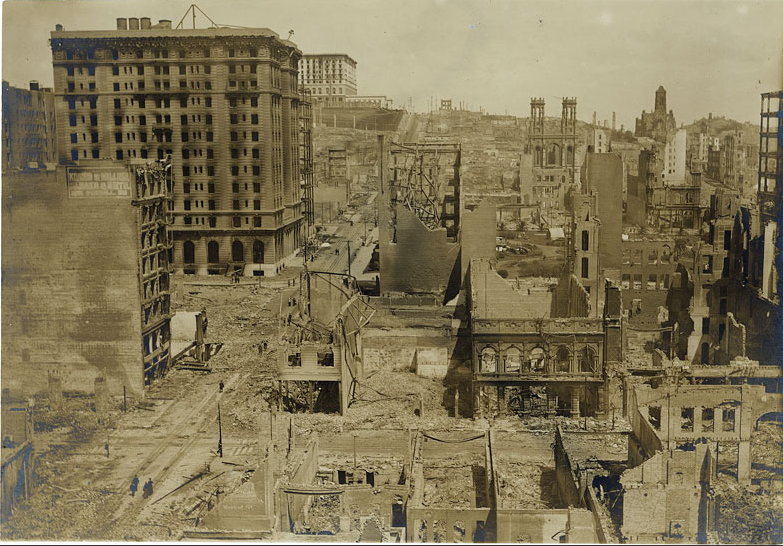 The buildings along the north side of Market Street from Kearney to Powell, which had been saved by the firemen when the south side was all afire on the 18th, were burning by 4 A.M.; the west side of Powell, from Geary down to Eddy was burning at 4 A.M., and the Flood Building still stood. but about 4:30 it succumbed to the heat and fire got into it at the 8th floor. Practically everything from Market Street north along Powell to Clay was gone, and the fire was going west. As we are treating the whole of the City north of Market street as one section, it would be well to insert here that at five o'clock in the morning, the Hayes Valley fire was finally stopped at the west along Octavia Street and south of Fell Street it was stopped half a block east of Octavia. Twenty-four hours after the earthquake, the firemen, possibly assisted by some dynamiting, had stopped the fire at Octavia Street, a permanent boundary of the "burned district", by strenuous effort, assisted by neither wind, hills, or vacant lots. 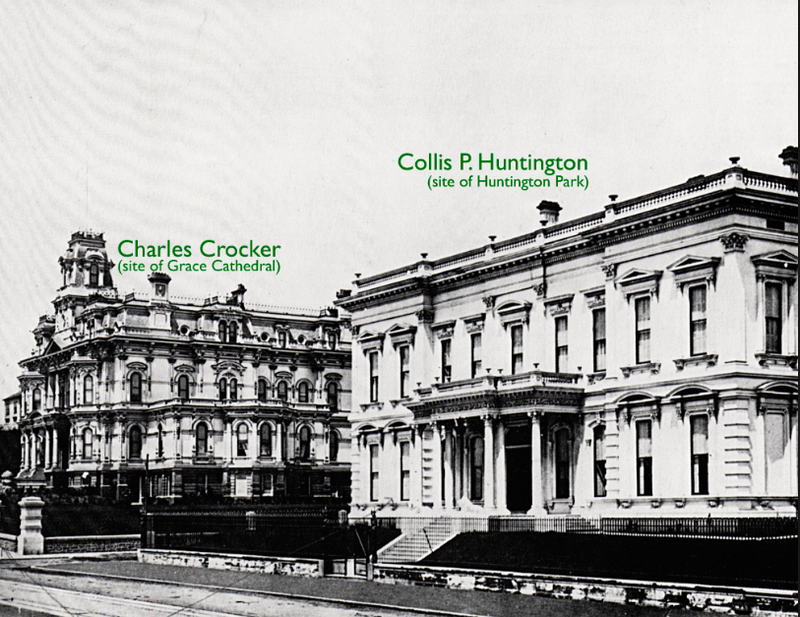 Mark Hopkins Institute of Art, the property of the University of California, was the next prominent landmark to be destroyed. For a long time the presence of water in cisterns on top of Nob Hill helped the firemen in a desperate effort to save the building. 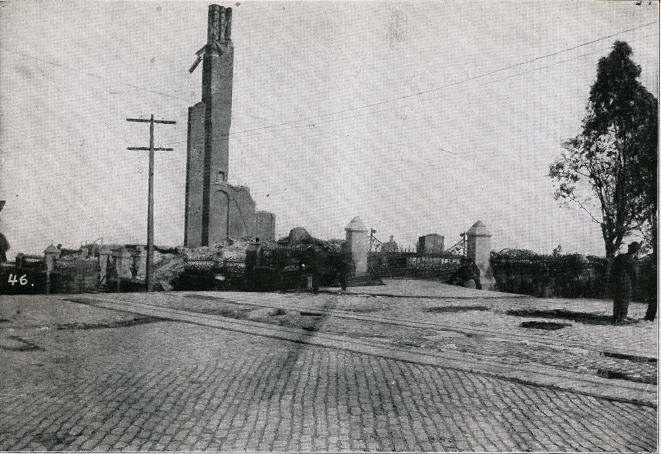 Because his sentences cover many points of interest during the April days, I will quote from the report of the Captain of 3 Engine - "We then played a stream on the Mark Hopkins Institute and surrounding building until the water supply in that cistern (California and Mason Street) was exhausted. I then put Engine 3 to work on the cistern inside the grounds of the Institute. While working on the Institute we were visited by His Honor the Mayor, who came up into the building to encourage us in our good work, and left orders to work our best in trying to save the Institute. Under the direction of Battalion Chief O'Brien, we continued working until the fire surrounded us in a very threatening manner, and to save our apparatus we had to leave there." From here the fire burned west, destroying the famous residences of Nob Hill. Across California Street it went around the Fairmount to the North, and crossing back from Sacramento Street, got into the Fairmount from the west, about eight o'clock on the morning of the 19th. All forenoon it burned north toward Russian Hill, west toward Van Ness Avenue, and then again east along Pacific and Broadway toward Montgomery Avenue and Barbary Coast. During the night the fire below Geary Street had burned very rapidly, and as early as 2:30 o'clock A.M. was working along O'Farrell Street west of Mason. At Jones Street it would meet the fire from the Hayes Valley, which had burned east to Leavenworth and north to O'Farrell Street. 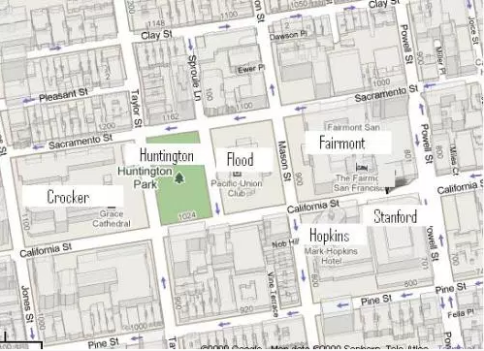 At 11:30 o'clock on Thursday, the 19th, the fire from Clay Street south to California had reached Jones Street and extended south to Sutter and Leavenworth. Some dynamiting at different corners along Larkin Street, and at Sutter Street and Polk did nothing to stay the fire's progress. At 1:30 P.M it had reached Hyde and Clay Streets, and Larkin and Sutter. North of Washington Street the direction taken by the fire was more north than west, and in that section had reached Pacific Street by noon, and was slowly but gradually assuming a westerly direction. At three o'clock dynamiting and back-firing was started on the east side of Van Ness Avenue from Washington Street to Sutter. South of this the firemen had water and were prepared to meet the fire when it reached Van Ness Avenue. At 4:30 P.M. the line of fire was at Polk Street, and the buildings along Van Ness were burning. With the exception of the district between the south side of Clay and the north side of Sutter, Van Ness became the western boundary of the fire. Again the effort of the fire department and volunteers had stopped the fire. In this they were assisted by the width of the street, but without the human effort this would not have held the flames in check. South of Washington, the fire had at this time 6 P.M., crossed Hyde Street, and was coming on toward Van Ness Avenue along Jackson Street. The fire seems to have first crossed to the west of Van Ness Avenue at or near Sacramento Street. 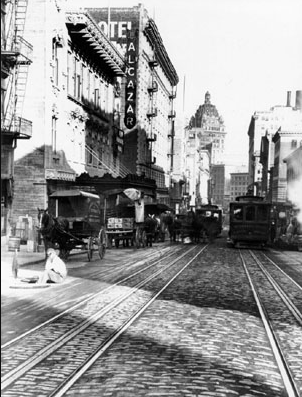 As early as 6 P.M. the Spreckels stable on Sacramento Street was afire, as were the buildings adjoining on the west; this fire crossed Sacramento to the South and burned as far west as Franklin Street. Dynamiting, and water relayed from Laguna Street stopped the fire along Franklin Street, and along the north side of Sutter Street about 3 A.M. of April 20th and the Western Addition was saved. As the fires further north reached Van Ness they were prevented from crossing, and all the section west of Van Ness was out of danger. Going back to the section a round Russian Hill we find the fire had burned during the day all the section south of the hill, west to Van Ness, and east of the Hill had burned north beyond Union Street, and east a cross Montgomery Avenue. On the morning of the 20th April it reached the west base of Telegraph Hill and had again threatened without success the Appraisers Building. 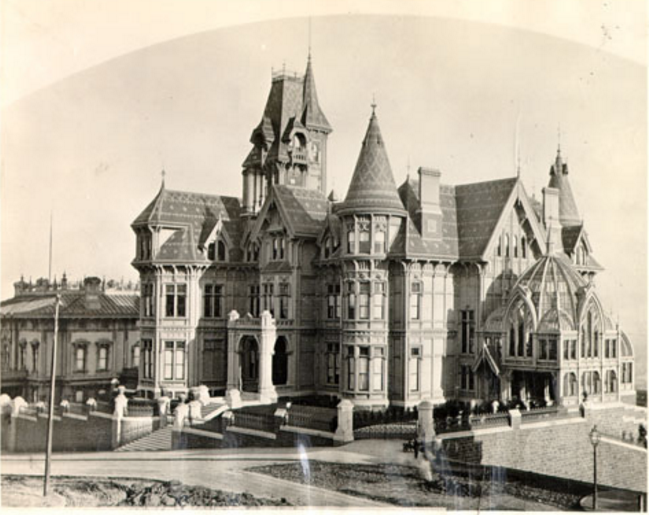 Elegant mansions of Nob Hill lost as a result of the fires. James Flood mansion, catty corner from the Mark Hopkins mansion is the only residence not burned to the ground on April 18, 1906. Scenes of the fire from the Library of Congress 15 minute 1906 film by anonymous cameraman.